Americans know that the nonsense from the US Bureau of Labor Statistics about a 4.3% unemployment rate and an abundance of new jobs is fake news. The BLS gets the low rate of unemployment by not counting the millions of discouraged workers who cannot find employment. If you haven’t looked for a job in the last 4 weeks, you are not considered unemployed. The birth/death model, a purely theoretical construct, accounts for a large percentage of the non-existent new jobs. The jobs are there by assumption. The jobs are not really there. Moreover, the replacement of full time jobs with part time jobs proceeds. Pension and health care benefits that once were a substantial part of the pay package are being terminated. Not only must Glass-Steagall be restored, but also the large banks must be reduced in size. 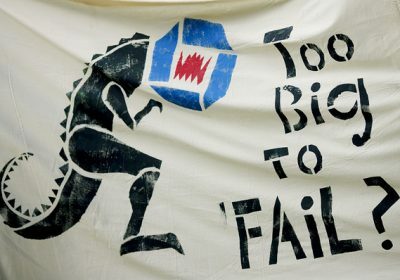 That any corporation is too big to fail is a contradiction of the justification of capitalism. Capitalism’s justification is that those corporations that misuse resources and make losses go out of business, thus releasing the misused resources to those who can use them profitably. Capitalism is supposed to benefit society, not be dependent on society to bail it out. I covered the story for Business Week. But despite the facts as laid out by the preeminent banker of our time, the palms had been greased, and the folly proceeded.